Click 3D eliminates the risk of fraud by verifying a customer’s identity on the phone, on the web, via web chat or SMS without storing any sensitive data. Click 3D eliminates the risk of fraud by verifying a customer’s identity in Card Not Present (CNP) transactions using a secure URL link. 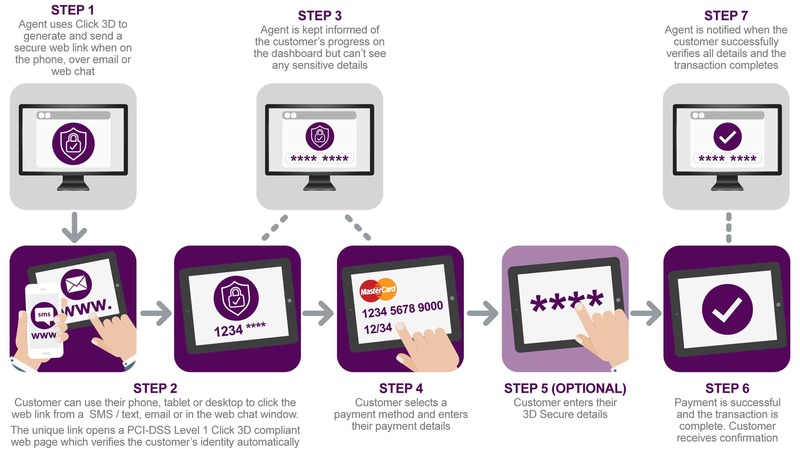 Since 2011, Click 3D has been saving organisations thousands of pounds in ‘non-secure’ CNP charges from fraudulent transactions by adding a crucial layer of security to your payment services – whether on the phone, on the web, via web chat or SMS, with a 100% success rate when combined with 3D Secure*. Customers securely and conveniently confirm their identity during the transaction via a secure link delivered by email, SMS or within a web chat, without disclosing sensitive information to your organisation or staff. Verification details are passed through a PCI DSS Level 1 environment quickly and securely, protecting against the rise of fraudulent activity as reported by reputable industry experts. *100% charge-back protection available with the maximum level of 3D Secure and Click 3D. Other levels of 3D Secure are available but do not guarantee full protection from fraudulent CNP charge-backs. What makes Click 3D from Key IVR different? We have a wealth of experience developing, delivering, integrating and tailoring solutions to suit the specific needs of an organisation – with hundreds of clients across numerous market sectors. As a leading payment solutions provider, we have a close relationship with all major PSP and payment gateways such as Worldpay, Barclaycard, Cardstream, Sagepay, and more – ensuring our services work seamlessly and effectively. As Click 3D is a fully-hosted solution, there is no on-site installation and sensitive information is processed through Key IVR’s PCI-DSS Level 1 compliant environment, the highest level of card data security. It can be an additional service to a range of payment methods and services, adding an layer of protection for your organisation against the rise of fraudulent and malicious transactions. Click 3D is versatile, working alongside an existing payment solution to improve security and eliminate 100% of chargebacks. Secure, DTMF suppressed card payments solutions that keep Contact Centre Agents connected to their customers. For an added layer of protection, a Click 3D can be generated by an agent and delivered via SMS, email or as a link via web chat. Using a dedicated Click 3D portal, a web chat agent can generate a unique and secure link that can be pasted into the web chat conversation for the customer to click. The agent is notified once the customer’s identity has been verified has been successful and the transaction can continue. Hosted on a fully-branded PCI-DSS Level 1 secure online payment portal, Click 3D will present an additional verification screen for customers to provide details before the transaction can continue. Ensure protection for transactions taken on the field. Your staff can generate a unique link via SMS or email for each customer to verify their identity on any connected smartphone, tablet or desktop. An effective and efficient way of reaching more people in a reduced time than it would take for contact centre agents. Verify customer’s identities quickly and conveniently by directing them to an automated IVR powered by Click 3D, or for SMS campaigns include a dynamic and secure web link. We’d be happy to show you our Click 3D solution in action with a one-to-one on-screen demonstration from a payments expert.